Hyper linked (underlined, colored) numbers have pictures. be used for commercial purposes or displayed on other web sites without permission. 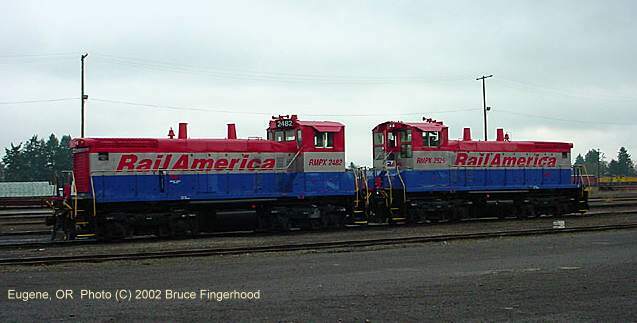 Each locomotive on CORP is listed by assignment. 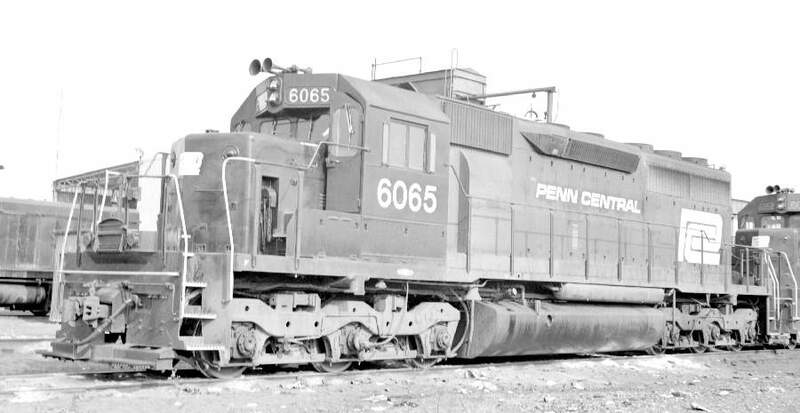 UP power for the day is included as are the nitty gritty details of all units on CORP.
A table of CORP locomotive sightings in various locations thoroughout the year. 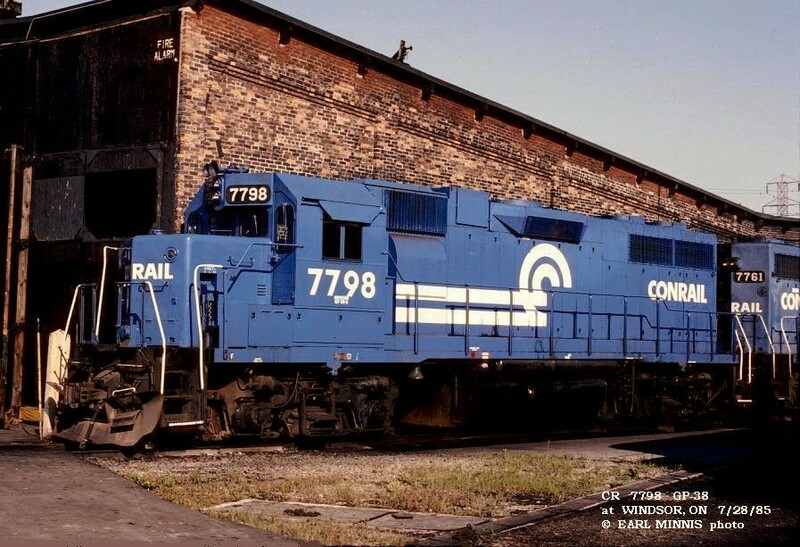 NREX 770 (none) SD40-2 SOO(CP) 770* SOO 770 11/73 See NREX photo for heritage information. 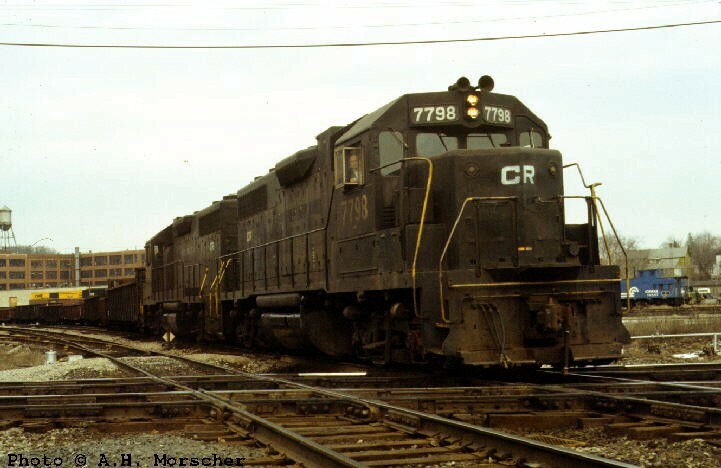 NREX 784 (none) SD40-2 CP 784 SOO(CP) 784 SOO 784 10/74 See NREX photo for heritage information. RMPX 2525 (none) SW-1500 (UPY 1111) SP 2525 08/69 See RMPX photo for heritage information. by VMV w/Q-Tronics in (c.1998); To CORP on (c.02/00). 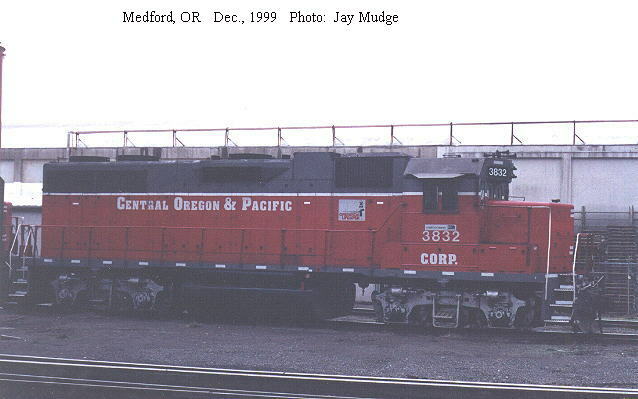 CORP 3804 (none) GP38-3 CBNS 3804 CSX 2128 C&O 4828 07/70 See CORP photo for heritage information. 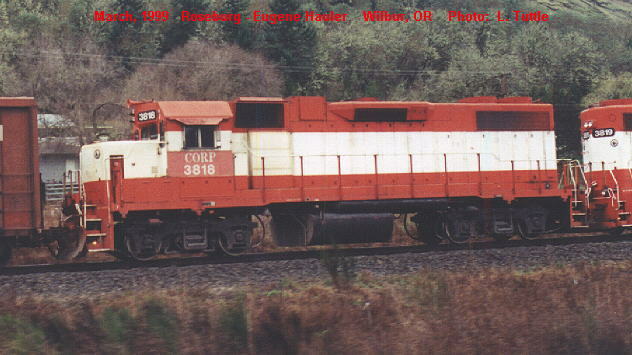 Rebuilt by VMV w/Q-Tronics in (c.1998). 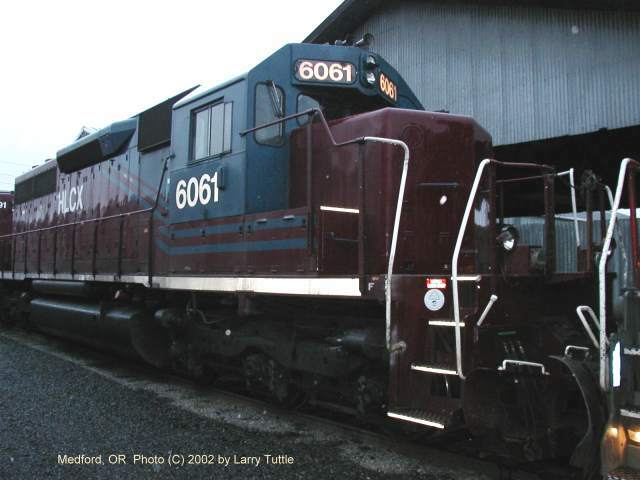 CORP 3807 (none) GP38-3 CSX 6796 SBD 6796 WA 705 05/70 See CORP photo for heritage information. 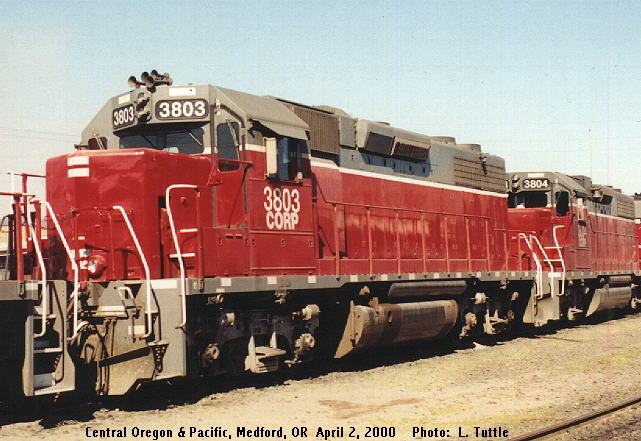 CORP 3809 (none) GP38-3 LLPX 2002 NS 2719 SOU 2719 1969 Rebuilt by VMV w/Q-Tronics in (c.1998). 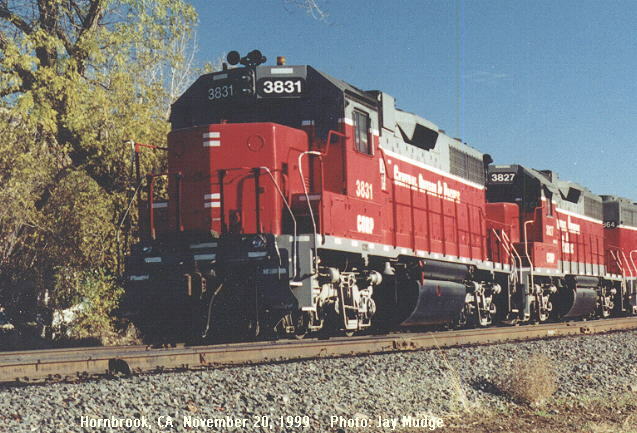 CORP 3810 (none) GP38-3 LLPX 2004 NS 2723 SOU 2723 1969 Rebuilt by VMV w/Q-Tronics in (c.1998). 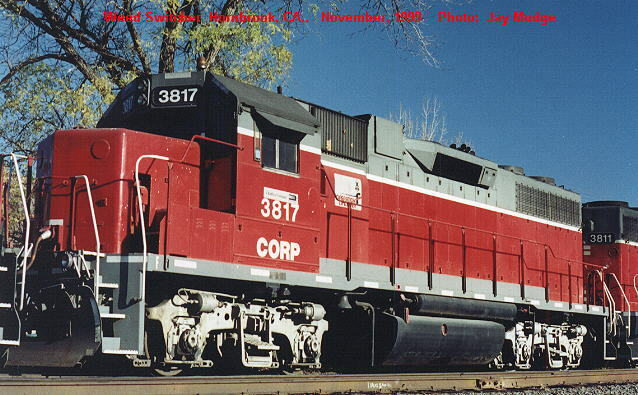 CORP 3811 (none) GP38-3 LLPX 2005 NS 2726 SOU 2726 1969 Rebuilt by VMV w/Q-Tronics in (c.1998). Back on CORP as of 03/05. 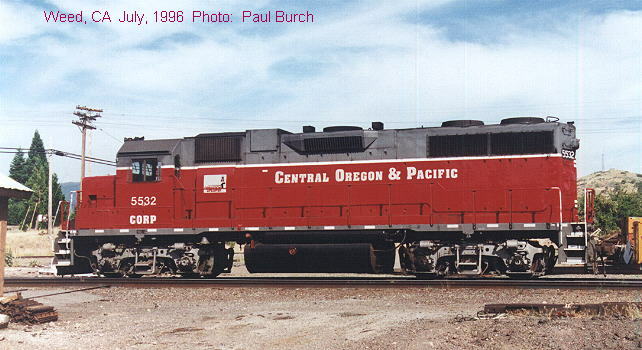 CORP 3831 5532 GP38 CRL 337 PLE 2032 PC 7783 09/69 ex-CR 7783; Returned to lessor 9/84. 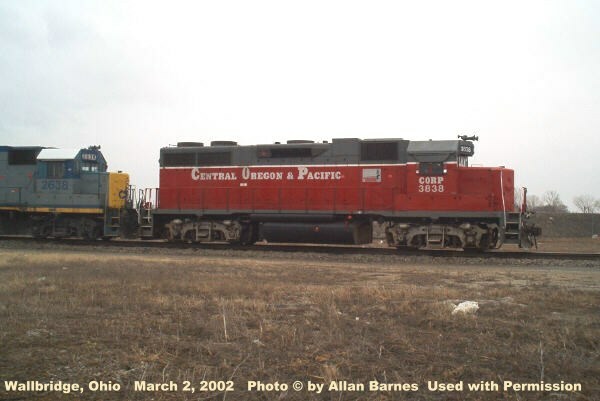 (c.01/01); Retired by UP (c.04/04); Sold to NREX (??). Retired by UP 02/02. Sold to NREX (??). 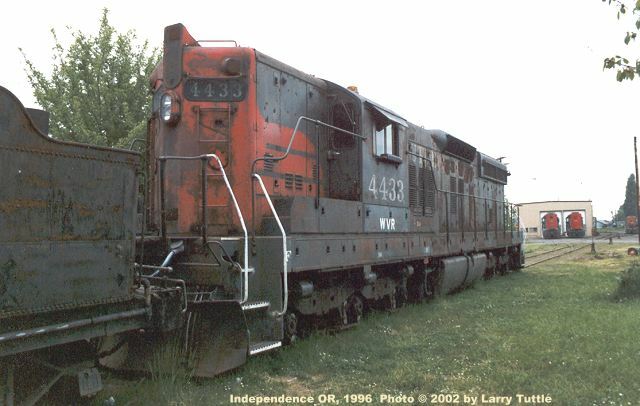 NREX 5848 (none) SD40-2 CP 5848 1977 Retired 2002. 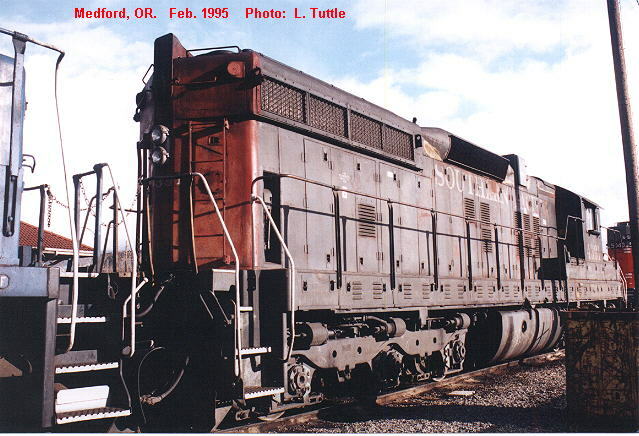 & rebuilt by Boise Locomotive Co. 8/96. 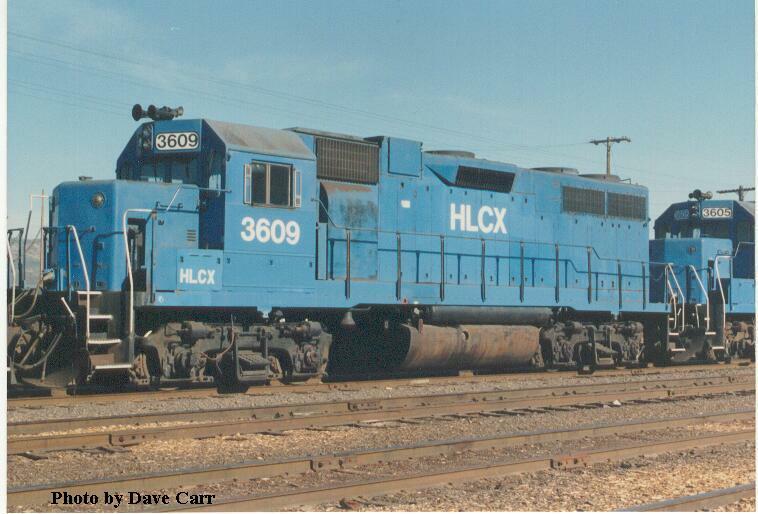 HLCX 6091 (none) SD40-3 CN 5208 09/71 See HLCX photo for heritage information. 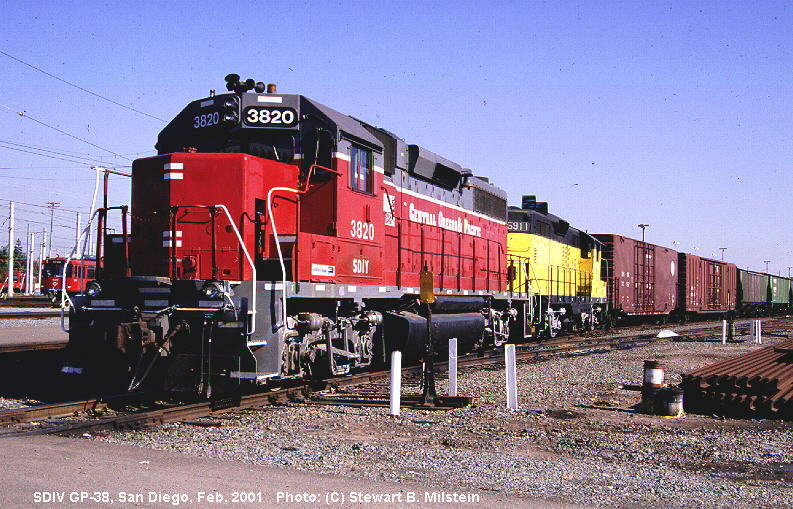 CORP 3806 ** GP38-3 DGNO CBNS 3806 CSX 6598 B&O 4023 1971 Built as a GP40; To IORY; Never on CORP.
left CORP 2/02 for AZER; left AZER 2004. Sent to KYLE RR on ?? Left CORP (c.02/02) for PSP. 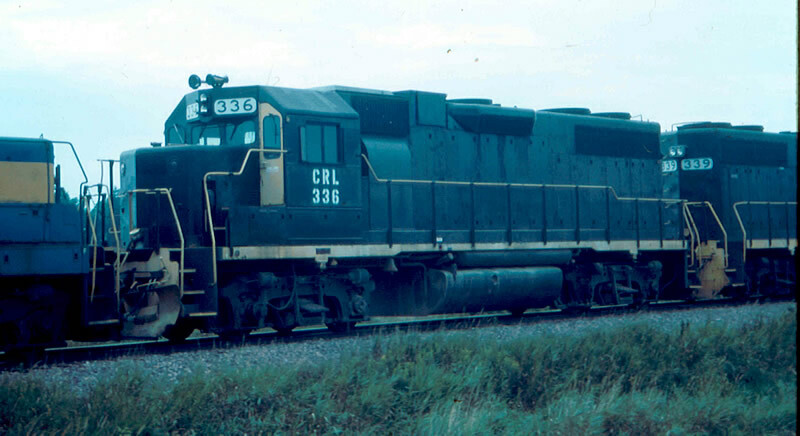 CORP* 3838 GP38AC HESR CSX 2153 SBD 6244 L&N 4023 05/71 CORP 5153 on IORY; To MMRR; To HESR. 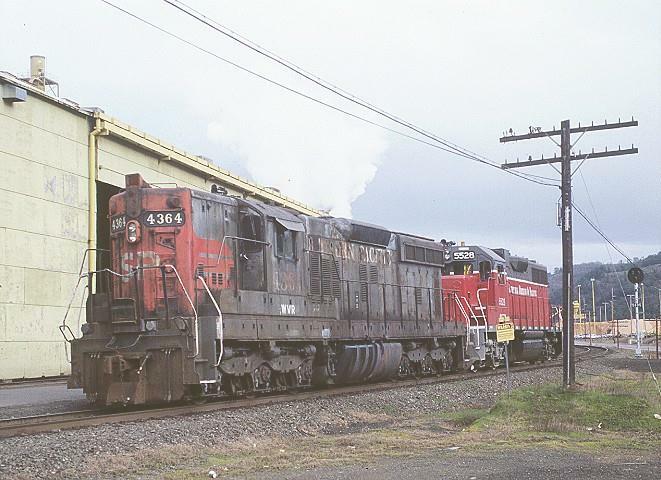 CORP 4020 GP40 MNA NS 1354 NW 1354 1966 ex-CORP 1354; Was on IORY. 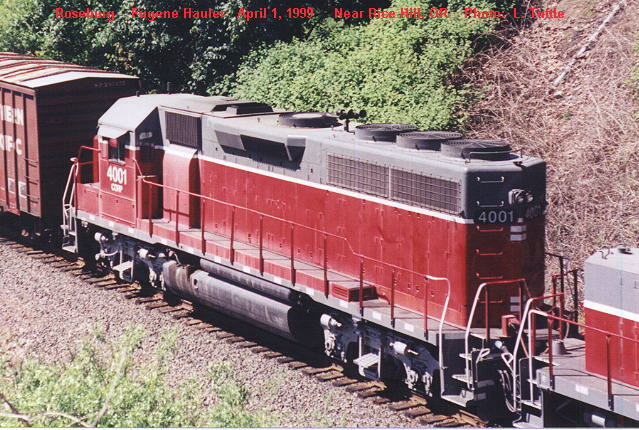 CORP 4021 GP40 MNA BN 3076 GATX 3704 B&O 3704 02/69 See CORP photo for heritage information. 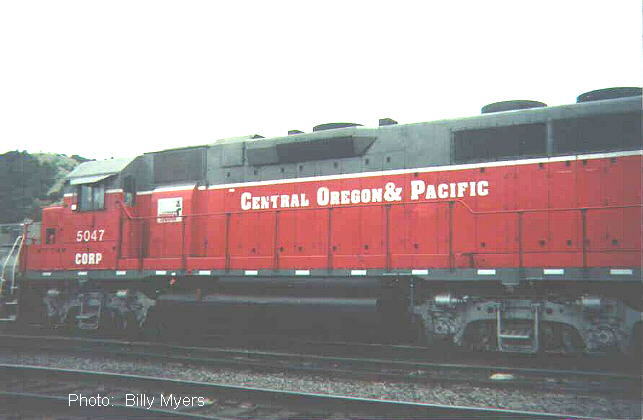 * "Central Oregon and Pacific" lettering on long hood. 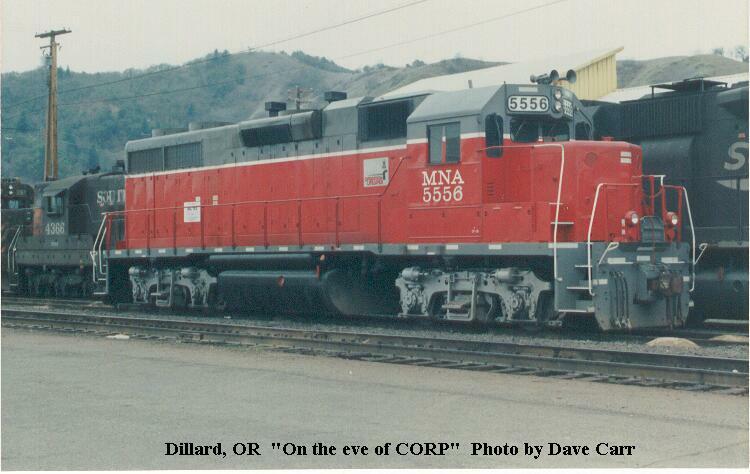 ** Reporting Marks still say "CORP."
Transferred to DGNO as 4016 on 01/99. Transferred to DGNO 4017 on 01/99; Transferred to KRR on 03/03. 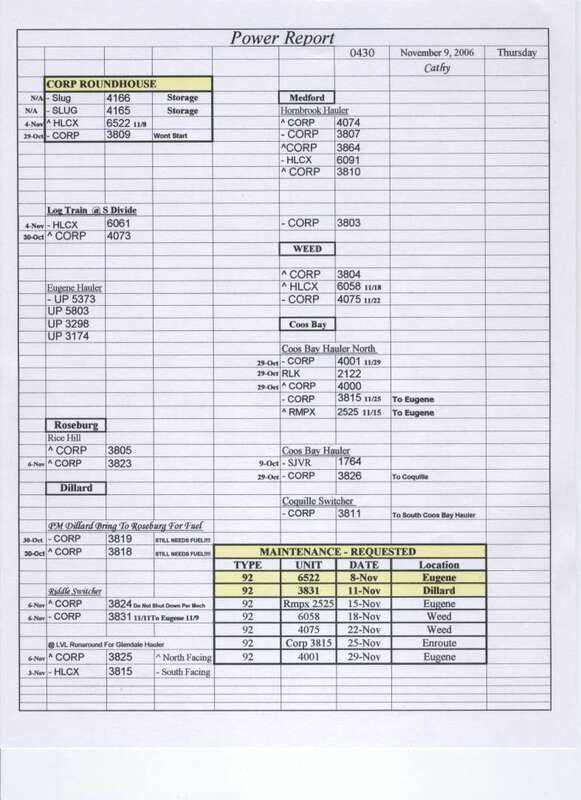 Transferred to DGNO as 4018 on 01/99. 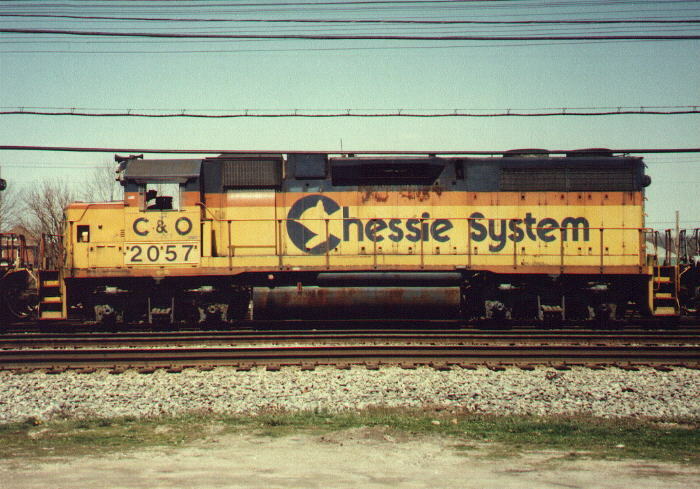 Renumbered UP 2386 10/98; Renumbered by UP 10/03. 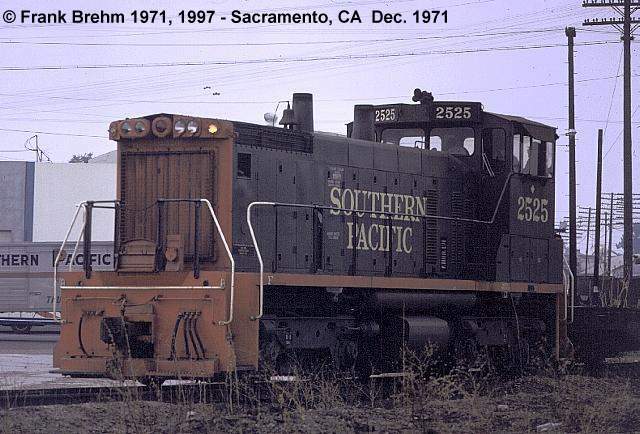 Renumbered UP 2387 11/98; Renumbered by UP 11/02. 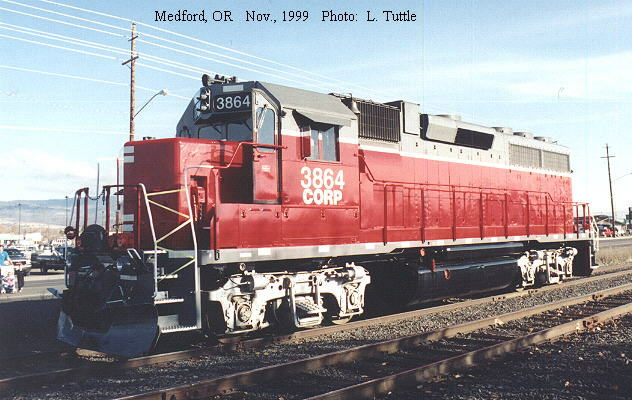 CORP 5535 GP38 CRL 340 PLE 2035 PC 7753 08/69 CORP 3858? CORP 6440 GP9 CSX 0440 B&O 6440 B&O 690 05/55 GEXR 901 See CORP photo for heritage information. AUNW 55 GP9 KYLE 5932 DRGW 5932 06/56 NOPB 1501 See AUNW photo for heritage information. 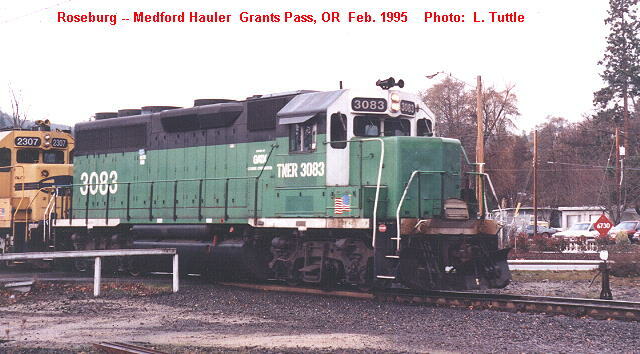 Used on Fiber Optics Trains; Delivered to NOGC 11/03. (??-?? ); Acquired PNWR 12/00; Painted into PNWR colors (??). 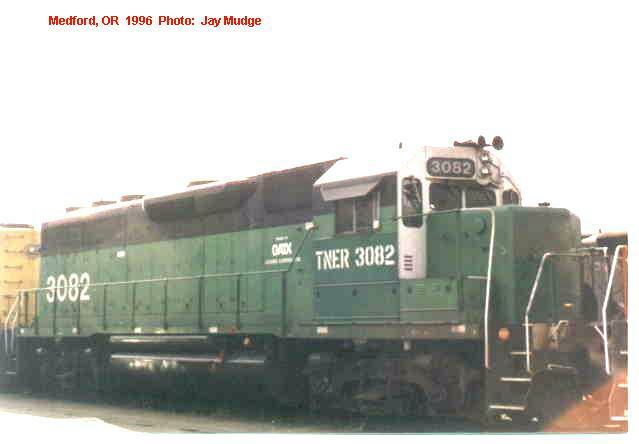 Leased as IANR 3607 8/95; Returned to Helm 1/01. 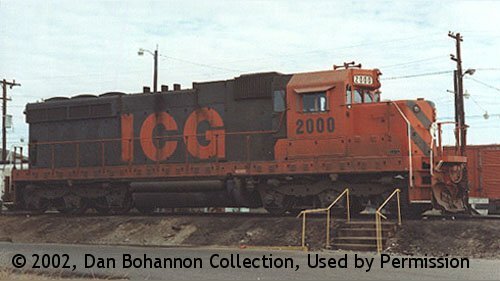 HLCX 3610 GP38 GWWR 2021 CR 7750 PC 7750 08/69 HLCX 3610 See HLCX photo for heritage information. 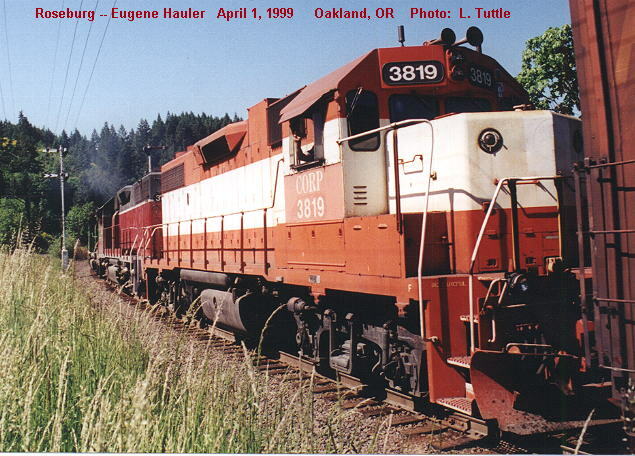 EMD 183 GP40 MKT 183 09/67 EMD 183 See EMD photo for hertitage information. 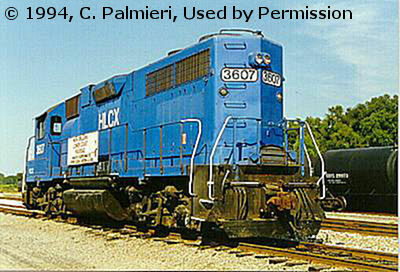 EMD 190 GP40 MKT 190 10/67 EMD 190 See EMD photo for hertitage information. 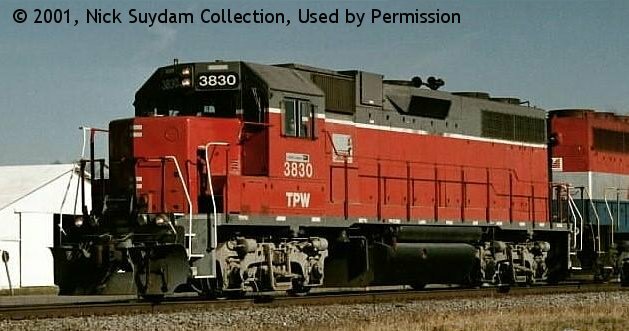 Used on an as-needed basis by CORP, POTB, and PNWR/W&P.